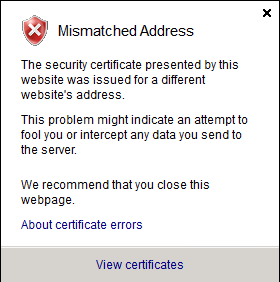 The above image shows the error on my SSL cert when I tried to access my sharepoint website from sharepoint. I tried finding solutions online but they don't cater for SharePoint specifically. How do I create a self-signed certificate that matches my sharepoint site? Or if its possible, how do I change the certificate common name in my self-signed ssl certificate? I tried following this: http://blog.walisystemsinc.com/2012/12/setup-ssl-in-sharepoint-2013.html but they want to create a web application from scratch, whereas my web application has already been created, so I can't follow the steps. You could create a self-signed certificate from SharePoint server IIS manager. Go to root of IIS manager. Generate corresponding .cer file and configure SharePoint to use it. For detailed steps, you could check below threads for sample. Not the answer you're looking for? Browse other questions tagged sharepoint-server iis ssl or ask your own question. Is it possible to implement SSL/HTTPS on a SharePoint site thats not running on port 80?